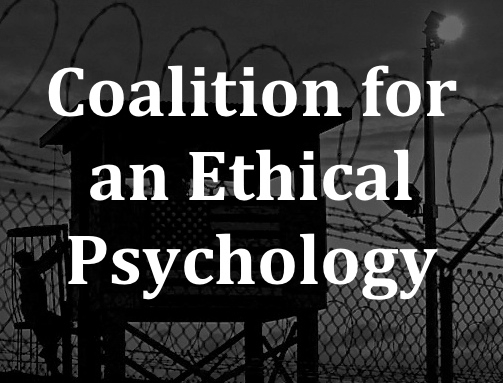 Amid disturbing reports that psychologists were involved in the abuse and torture of prisoners at Guantanamo Bay and elsewhere, the American Psychological Association (APA) Task Force on Psychological Ethics and National Security (PENS) met in the summer of 2005. Over two days they considered whether the Bush Administration’s no-holds-barred “enhanced interrogation” policies crossed ethical boundaries for military psychologists. Six of the nine voting Task Force members were on the payroll of the military/intelligence establishment, and some of them worked in the chains of command when and where instances of abuse and torture had reportedly occurred. So we should not be surprised by the Task Force’s conclusion that psychologists play an important role in keeping detainee interrogations “safe, legal, ethical, and effective.” This assessment affirmed, nearly verbatim, the military’s own description of Behavioral Science Consultation Team (BSCT) psychologists — a description that had been provided to the Task Force in writing before their deliberations even began. Professional psychology has made valuable contributions to national security through collaborative efforts with government agencies — and it will undoubtedly continue to do so. But does anyone truly believe that crucial determinations about psychological ethics should ever be guided by the views and agenda of the Secretary of Defense or the Director of the CIA? The many glaring flaws associated with the PENS Report are especially revealing since the APA is, after all, an organization of psychologists . It’s therefore very unlikely that the Task Force organizers were somehow unaware of the potent psychological influences of power differentials on group dynamics; of authority structures and conformity pressures on independent decision-making; and of self-interest on objective, unbiased analysis. It’s far more likely the organizers knew exactly how to create the conditions that would reliably produce the outcome they sought. Today, a grassroots campaign is underway calling on the APA to annul the PENS Report. This call for annulment is ultimately inseparable from important issues of accountability and transparency. Audre Lorde’s reminder that “the master’s tools will never dismantle the master’s house” is helpful in describing the challenge. The key leadership of the APA today includes several high-level staff members who were central figures in the PENS Task Force fiasco. Similarly, two current Board members were also on the Board in 2005 when it approved the PENS Report in an emergency session. At a time when the destructive and corrupting consequences of too much power in too few hands have never been more apparent in corporate boardrooms on Wall Street (and elsewhere), how much different is the situation at APA headquarters? In the six years since the PENS Report was issued, APA leadership has never encouraged a thorough reconsideration of the Task Force’s deliberations or the Report’s conclusions. And they have never, even in hindsight, expressed regret for any decisions made — despite the fact that the passage of time has repeatedly brought to light further evidence that psychologists acted as planners, consultants, researchers, and overseers to abusive and torturous detainee interrogations. Sadly, APA instead has relied on stonewalling and obfuscation. Why was the PENS Report put to an “emergency” vote of the Board alone, rather than bringing it before the Council of Representatives which, according to the APA, “has sole authority to set policy”? Why was the head of the Practice Directorate given a lead role in the PENS proceedings even though his spouse had been one of the psychologists at the Guantanamo Bay Detention Center? Were representatives of the military/intelligence sector involved in the actual selection of members for the APA Task Force? Why were the identities of Task Force members not included in the Report itself and not made readily available to the press or to APA’s membership? And so on. Even at this late date, official answers to these and other longstanding questions would be welcome. It’s crucial to recognize that the PENS Report remains a highly influential and authoritative policy document today. The Report is used by the Department of Defense as guidance for BSCT psychologists; by military psychologists seeking to advance “operational psychology” as an area of specialization that includes aggressive counterintelligence and counterterrorism operations; and by the APA Ethics Committee as a guide to ethical behavior in national security settings. The importance and urgency of annulment are made even clearer by current moves in Congress to restore and legalize the use of torturous interrogation techniques. If these efforts succeed, in all likelihood psychologists will be called upon again to oversee and implement morally repugnant practices. Meanwhile, the annulment campaign is drawing broad support. To date, over 20 psychology and human rights organizations have officially endorsed the call, and over 1,100 individuals have stepped forward to sign the annulment petition online (www.ethicalpsychology.org/pens). They include a past president of the APA, APA’s 2012 president-elect, two members of the PENS Task Force itself, current and past presidents of APA divisions, psychologists who work with torture survivors, and psychologists who have spent their careers working with veterans at VA hospitals. At the same time, recognition of the urgent need for annulment extends well beyond the profession of psychology alone. Also among the petition signers are psychiatrists such as Robert Jay Lifton (author of The Nazi Doctors) and Stephen Xenakis (retired Brigadier General, U.S. Army), scholar-activists such as Noam Chomsky and Daniel Ellsberg, attorneys who have represented Guantanamo detainees, and former members of the intelligence community. Interested psychologists and non-psychologists alike can join this effort by signing the online annulment petition at www.ethicalpsychology.org/pens. Please consider doing so.